Bangkok has many sights and attractions, some you will not find in any other place on earth. Arguably the most impressive and spectacular is the many Buddhist temples in and around Bangkok. Grandiose temples are synonymous with Bangkok, no visit to the city is complete without visiting at least two or three. The most spectacular of all the temples is the Reclining Buddha temple, known in Thai as Wat Pho. It is the most impressive of all the temples in Thailand. The temple covers an area of 80,000 square metres, and contains over 1000 images of the Buddha. The temple has one of the biggest Buddha images on the planet, the statue of the Reclining Buddha is an enormous 46 metres in length. Equally impressive although not as large is the Emerald Buddha temple Wat Phra Kaew. 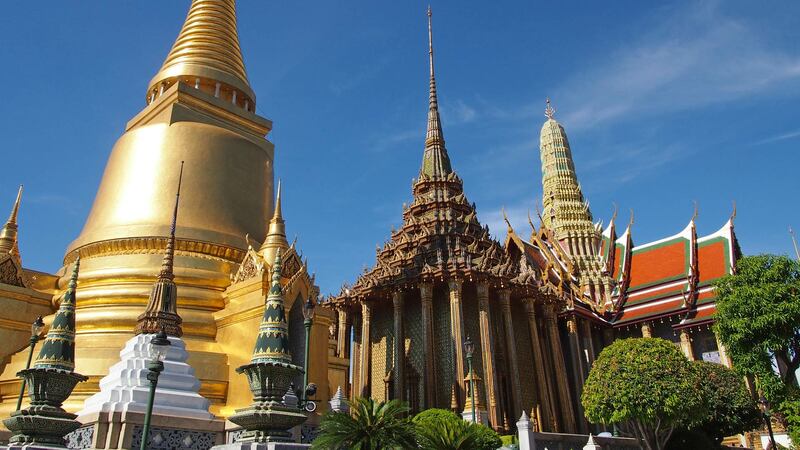 This smaller temple located in the grounds of the grand palace, is home to the Emerald Buddha. The Emerald Buddha is a 70-cm tall stunning figurine of the Buddha. The statue is in a Yogic position and is made almost entirely from Jade. The figurine is dressed in the most exquisite and delicate clothes made of solid gold, and the attire is changed several times per year with every season. The third spectacular temple in Bangkok is the Golden Buddha temple Wat Traimit. What makes this temple spectacular to visit is that it houses a huge golden Buddha. This impressive statue, stands a full 3 metres high and tips the scales at an impressive 5.5 tons. What makes this statue so impressive is that it is made almost entirely from pure gold. It is estimated to contain gold to the value of 250 million dollars. When visiting the Emerald Buddha temple, it is well worth your while to visit the Grand Palace at the same time. The place has been the home of the Thai Royal Family for the last 150 years. Construction of the palace began in 1782 during the rule of Rama I, and over the years many kings of Thailand added new buildings until 1925 when the palace became the marvel that it is today. Occupying an area of 218,400 square metres, the palace is home to some stunning gardens and art, as well as truly spectacular architecture.